1863: Unknown 1st Rhode Island Cavalryman to J. L.
This letter was sent unsigned but from the contents we can conclude with certainty that it was written by a member of Company E, 1st Rhode Island Cavalry. There is no accompanying envelope to aid in the identification of the recipient of the letter either, who is addressed simply as “Friend J. L.” and he appears to have been residing in Mystic, Connecticut in the summer of 1863. It seems that J. L. and the author were from the same hometown but whether that was Mystic or not is unknown and unlikely. Most of the First Rhode Island Cavalry’s service in 1862 was in northern Virginia, where it served as scouts to determine enemy movements, as well as foraging for supplies and screening infantry movements. The troopers saw action contesting Stonewall Jackson’s cavalry in the Valley Campaign. They fought in the Second Bull Run Campaign, as well as many other battles of note, including service in the cavalry actions surrounding the Battle of Fredericksburg. In 1863, they participated in the Chancellorsville Campaign, and played an important role in the opening battle of the Gettysburg Campaign at Brandy Station. 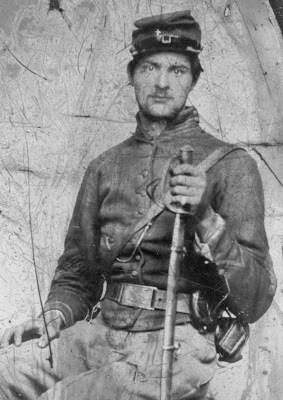 Shortly thereafter, isolated and alone deep in Confederate territory on a scouting mission, they lost nearly 240 of their 280 remaining men at the June 17 skirmish at Middleburg. The regiment was refitted with new recruits and performed scouting and outpost duty along the upper Potomac River until September, when they rejoined the Army of the Potomac, participating in the Bristoe Campaign and Mine Run Campaign. Events described in the letter clearly indicate the author’s membership in the First Rhode Island Cavalry and place him with Capt. 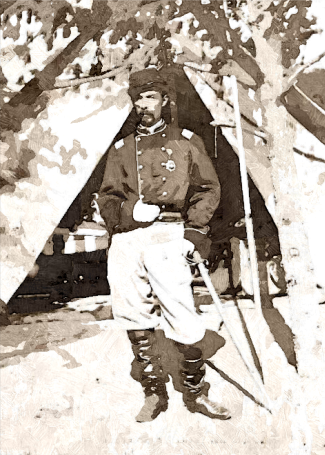 Allen Baker, Jr.’s troop camped near Centreville, Virginia, in August 1863 performing scout duty. One year ago today I was about 4 miles from this place and packing up to start for the front ¹ and we took the advance of Gen. Pope’s army and in twenty-seven days we were drove chock into Washington. Since that time I have knocked around Va. and seen some hard fighting, done a great deal picket duty, and run a great many risks, but have come out right thus far while a great many have gone up. One year ago today this regiment numbered near eight hundred fighting men and since that time we have received four hundred recruits and today, where are they? First the Col. (Duffia) [Col. Alfred Nattie Duffie] is a General and is in Gen. Burnside’s Department [as] Chief of Cavalry. A great many have been discharged, some are sick in different hospitals, [a] number have been killed, and the remainder (about 400) it is hard to tell where they are. About 200 are at Richmond [as] prisoners of war, about one hundred are at the front with Lt. Col. [John L.] Thompson, about eighty are here [in Troop E] under Capt. [Allen] Baker, ² about twenty went by here this morning driving cattle, and we are scattered all over Va. The fine regiment we were once is no more and if something is not done to gather us together soon and recruit and reorganize us, we will be but poor help for Uncle Sam. I expect that the conscripts will begin to flock in soon and then you may look out. It will be drill, drill from “early morn until dusk of day.” As it is now, we do not drill any. We have to scout and picket. I returned last night from a twenty-four hours ride. It is no funny thing to saddle up and start off and ride twenty-four hours without stopping to rest more than an hour. But we have it to do and pretty often too. This squad is in the defenses of Washington under Gen. [Samuel P.] Heintzelman and a good many think that it is an easy job but they are mistaken for they will keep a fellow busy, let him be where he may. It is hot enough here today to roast a fellow. I have nothing on but my pants & shirt and the sweat rolls right off as though I was out in the field mowing. Just write as soon as you get this and let me know who of the drafted men around home are going to pay. It is about time to water horses so I’ll stop hoping soon to hear from you. So goodbye. I have no stamps. I’ll have to get this letter stamped and you will have to pay before you you can get it. I am going to send this to Mystic. I don’t whether you are there or not. This entry was posted on Monday, September 29th, 2014 at 2:06 pm	and posted in Uncategorized. You can follow any responses to this entry through the RSS 2.0 feed.